LOUISVILLE, Miss. -- Thirteen Winston County children were the test pilots of a new 4-H program while their schools were on spring break. After seeing a demonstration of the 4-H Lego Engineering Club curriculum in February, Sandra Jackson, an agent of the Mississippi State University Extension Service in Winston County, immediately wanted to use it during a camp she was leading in March. 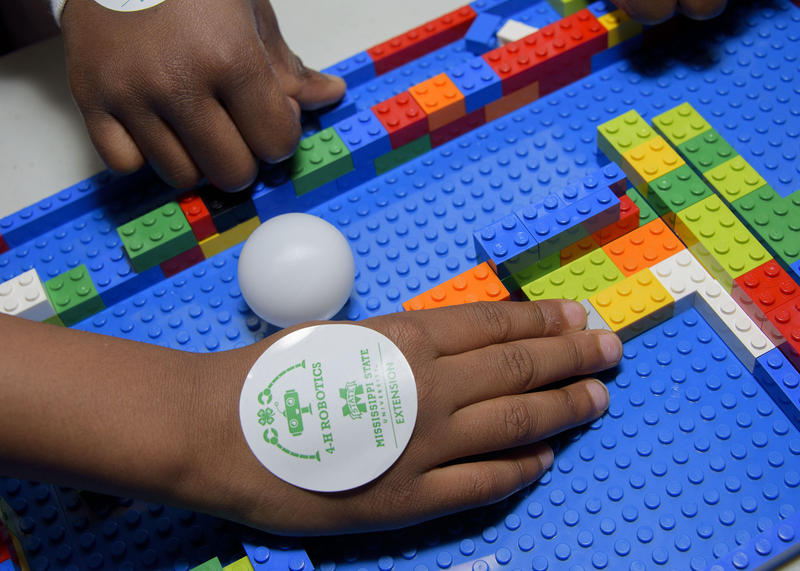 The program, designed for Cloverbuds, or 4-H'ers aged 5-7, uses Lego bricks as teaching tools for fundamentals of science, technology, engineering and math -- STEM. The demonstration Jackson saw was by Mariah Morgan, an assistant Extension professor with the MSU Extension Center for Technology Outreach. Morgan oversaw the Lego Engineering Club’s development. The curriculum was partially funded through a grant from the Center for Community-Engaged Learning at MSU. Each of the program’s six lessons is aligned with 4-H Science and General Common Measures, Next Generation Science Standards, and Mississippi College and Career Readiness Math, Language Arts, and Writing Standards. One lesson involves designing a Lego maze that is difficult to navigate but wide enough to get a ping-pong ball or toy car through. Other lessons challenge children to build the tallest Lego tower and to build a Lego bridge that can support the weight of the most pennies. Jackson had her 4-H’ers measure the height of their towers after they built them. “Everything about this new program is going great, and it’s been effective in helping these kids learn math and reading skills they will need going forward,” she said. Reginae Williams, an 11-year-old junior 4-H’er who assisted Jackson and the Cloverbuds, said she got just as much enjoyment out of the program. “I’ve had fun working with the kids and helping them work together,” she said. MSU is in the process of publishing the program for use in 4-H groups statewide. Visit http://extension.msstate.edu/4-h/stem to learn more about Mississippi 4-H STEM programs.